Our National Parks have been called “America's Greatest Idea”. That's a sentiment that I can get behind. The setting aside of public lands for the enjoyment of all people is imperative in this day and age of unchecked development (do we REALLY need more condos?). So, since our government has seen fit to provide us with these places, I decided that I should see as many as possible. I have been working on that for a few decades now. Yellowstone National Park was the first such set-aside tract in the US. Sitting in the Northwest corner of Wyoming, and extending into Idaho and Montana, it is a park that is larger than the entire states of Rhode Island and Delaware combined. A magical place of geysers, hot springs, waterfalls, lofty mountain peaks, and abundant wildlife, Yellowstone has something for everyone. However, it seems that year after year, everyone wants something from it. Our first National Park suffers from an overcrowding problem. In the busy summer months, it can become choked with automobile traffic and crowds. Old Faithful Geyser, the most famous such natural feature on Earth, now attracts crowds so large during the peak season of July and August that bleachers needed to be built to accommodate them. It looks like an ampitheater there now. We arrived in the park early enough, entering through the popular East gate. The approach road is undergoing some major construction, so we weren't able to just “cruise right in.” Once we had stopped at the entrance sign for our photo (always have to take a picture with the sign at National Parks) and then the Visitor Center at Fishing Bridge for our Passport Stamp (a stamp cancellation that shows the date you visited the park...we have collected hundreds), we made the turn into the Hayden Valley and headed North. We were immediately caught in a traffic jam. Seems a herd of Bison had decided that this was the perfect time to cross the road. When dozens of these 1,000 pound beasts want to cross the road, there really isn't much you can do except wait. So wait we did. 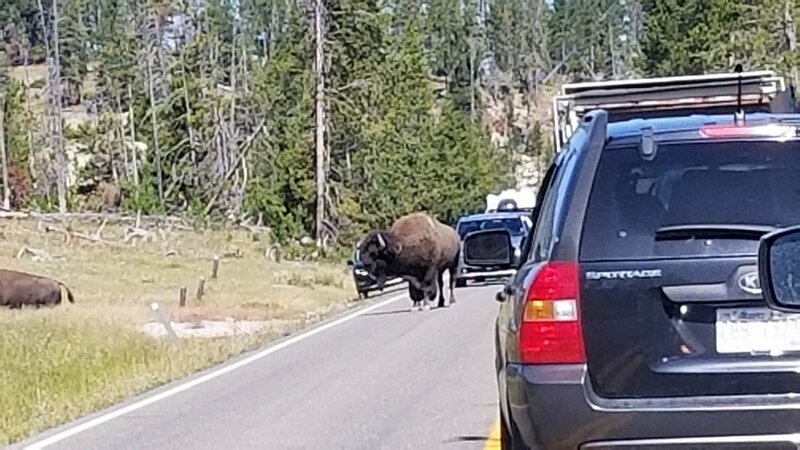 After about 40 minutes, enough Buffalo had cleared the road that cars were able to pass, so we continued North. 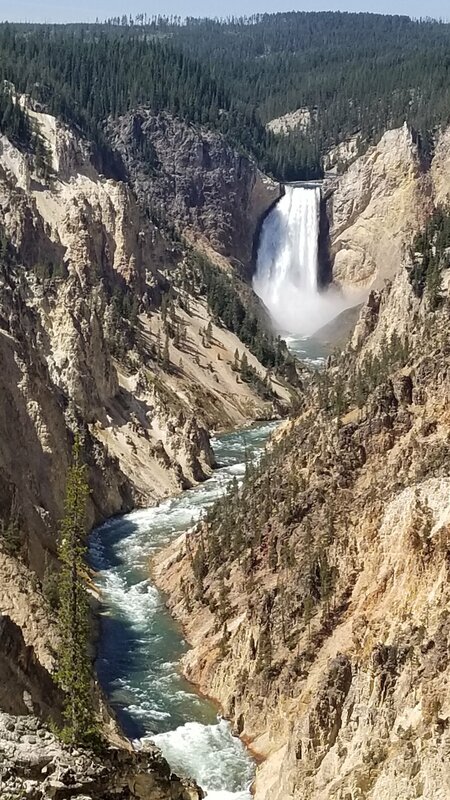 We stopped into Artist Point in the Grand Canyon of The Yellowstone to take photos of the Lower Yellowstone falls. But the crowds were so dense there that we immediately regretted the decision. We still took our photos but got out of there as quickly as we could. A little further up the road, we just cruised right on by the turnoff for the Upper Falls/Canyon Rim drive. Just way too many cars choking the road. Another quick stop at Tower Falls went much the same way, but we did get out of the car there and take some photos as well. Then fate took a turn. The hike that we wanted to take was closed! Due to bear activity! So on we drove. What we ended up doing was driving a one-way dirt road called The Blacktail Plateau Drive. While this got us away from the crowds, there were still more cars on that road than we normally see on National Park back roads. Unfortunately I think the secret is out. Overall, despite the setbacks, it was a wonderful day. We even were able to drive most of the remainder of the main park loop road before nightfall. Then it was back to our cozy cabin in Cody (say that 10 times fast). Tomorrow is a drive through Grand Teton, and on to Seattle for the real reason we are trekking...Pearl Jam!